Cali girl: Life lessons of a golden retriever. It’s been about two weeks ago that we took our 8-yr-old golden retriever Cali to the vet for what was supposed to be an operation to remove a large lump on her stomach and to have her spayed at the same time. According to the two vets we saw at different clinics, since we chose to not have her spayed at an early age (we were going to breed her but that ended up not happening) the lump was most likely cancerous but they wouldn’t know unless they took a biopsy and/or removed the large mass, about the size of a baseball. We decided to make her more comfortable and have it removed and then biopsied but one surgeon suggested having the spay take place at another time so that if it were cancerous it wouldn’t spread to the area that was being spayed. Fast forward, from the first and second vet opinions – we decided to take her into the first vet and get both procedures done at once and it was also about $500 less at an estimated amount of $900 to $1400 with the second estimate starting at $1500+. We had been praying about this situation as well as asking others to pray for Cali and were comfortable with getting her the surgery but knowing our finances we would not put her through chemo but try to keep her as comfortable as possible. Cali never complained, she was alway happy and wanting to please, still going on walks and coming when called. She would try to play but not as playful as in the past, although she still fetched her favorite football squeaky toy. She was eating fine and all in all it didn’t appear that she had any problems when you looked at her. We decided to apply for a Care Connection credit card to pay for the surgery and right after the second opinion we were told that the mass might break through in the next week but if wouldn’t remove all of what was in there. Cali would like at the lump and the day before the surgery, not only was she in heat, but the lump started to bleed slightly. We were relieved that the surgery was going to be the next day and thought even if it is cancer at least she will be comfortable for a bit and we’d have a few more months with her. On Monday we said our goodbyes as Cali was escorted to the vet my husband said she whined upon entering the vet’s office, which she didn’t do before and usually only does when she wants to go play with people or dogs that she sees – she was a typical golden, sociable and lovable. Only difference was there was no one else in the vet’s office besides the receptionist and no other dogs/animals so this was a different type of whining. When my husband turned to leave Cali in the vet’s office she barked at him to turn around and to not leave her there. Hubby turned to Cali and said, “stay” – which she knew her master’s voice and was obedient even though she didn’t want to. Now you may be thinking that’s normal for a dog but I had just taken Cali to another vet a few days before for a second opinion and she never made whining noises without wanting to go and play with the strangers and other dogs. She also wasn’t making a fuss when the vet tech took her “behind” closed doors to weigh her and to do xrays. That’s said, we’re sure she knew something was going to happen at this office and she didn’t want to be left there. What a horrible feeling for an owner and pet to go through, but you think to yourself that it’s for her best so you trust that when you leave your pet in the hands of a professional that they would do their best. I don’t want to relive this point but I’ll write it here, it’s part of the healing process. I was at work and my husband got several calls from the vet, there was a problem and Cali was bleeding internally. The vet said she was fine but he wanted to open her up again to see the cause. We were told by the second vet that we needed to be cautious of the amount of anesthesia that she was given because the second vet found by the xrays that Cali’s kidney was small for a dog her size, she was 72 lbs. The first vet, doing the surgery said he couldn’t read the xrays – not sure why as I saw them with the second vet who read them in front of me, pointed out Cali’s organs and told me that the mass had not spread to her lungs, then made a copy of the xray. That was a concern that the first vet may have had some other issues. He later admitted to my husband there was a “cut” that he made during the spaying part of the surgery which he did first and that was the reason that she most likely died. It was horrifying that as I went home (5 minutes away) to go to the vet’s office with my husband and stepdaughter that we got another call – Cali was gone. I actually walked out the door when I heard the phone ring on my husband’s phone as if that would have made any news go away. I couldn’t believe it, I was angry and a part of me is still angry – at myself, the vet and wondering “if only”. It’s too late now for the if only statements, our baby girl (youngest of our once three dogs – our eldest Nala passed less than a year ago at 14) was gone. I won’t go into the details as I’m near tears now, but all we could do as a family is grieve. I’ll end here for now, maybe another day I’ll be able to write about the rest of this event but it’s still too fresh, too painful, too sad. 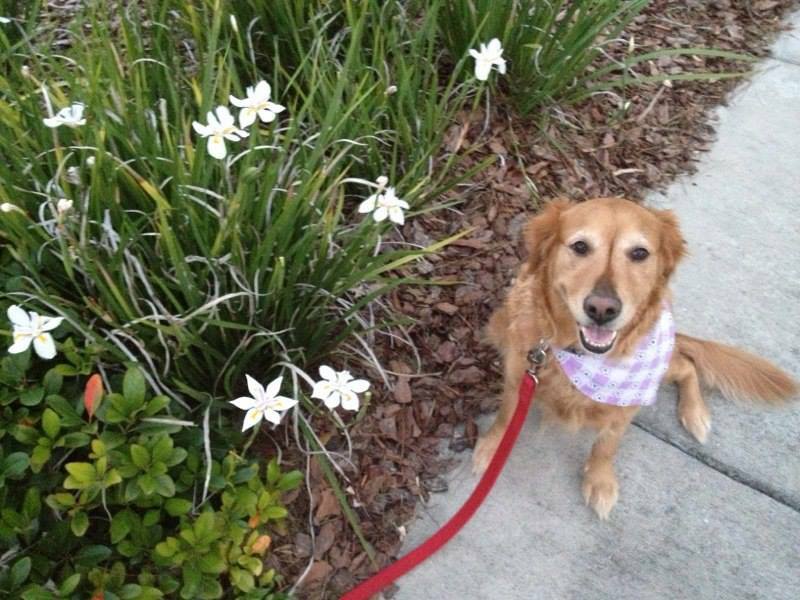 If you’d like to read the post I wrote on the life lessons I learned from our Cali – click on this link: Cali lessons of a golden retriever.